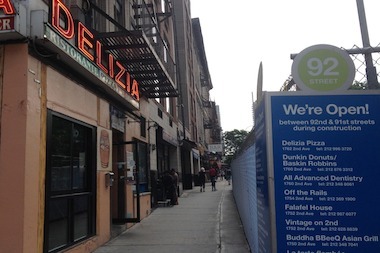 Profits at Delizia 92 have gone flat since construction started, the owner said. UPPER EAST SIDE — Joe Pecora, the owner of Delizia 92 on Second Avenue at East 92nd Street, used to see about 5 percent growth in profits each year from the pizza joint. But since construction on the Second Avenue subway line began in 2007, sales have gone flat. “Construction has really affected business," he said of the pizzeria, which has been in the neighbohrood for 26 years. "There’s not as much foot traffic and most people just don’t like to shop where construction is." City Councilman Ben Kallos is hoping to secure funds to help business owners like Pecora by creating grants for small businesses that have been negatively affected by municipal construction projects like the Second Avenue subway project. Since construction started, Second Avenue businesses have struggled with decreased foot traffic, high noise levels and excess dust and debris. According to Kallos's proposal, small businesses located within 150 feet of municipal construction sites would be eligible to apply for grants if they could show a 10 percent reduction in taxable income compared to the year before construction began. Businesses could seek funds for both physical improvements, like soundproof windows and improved ventilation systems, and for marketing and advertising efforts to reach more customers. In some cases, businesses would also be able to seek funds for payroll and rental assistance. Khalid, the manager at Falafel House on Second Avenue near East 91st Street, said profits at the eatery are down by about 30 percent compared to the year before construction began. However, he was not sure his boss would apply for a grant, wondering if the process would be too cumbersome and adding that a tax break would be preferred. But Pecora liked the plan, saying he would use the potential funds to update the outside of his store and invest in advertising. "I wish somebody had done this a while ago," he said. "But better late than never." Kallos is working to garner support for the idea through a public petition. He hopes other Council members who also have large municipal construction projects in their districts will get on board with the idea. He is looking at several different avenues to secure funding for the iniative, including introducing legislation or asking that money be set aside in next year's city budget. Kallos also hopes to work with city’s Department of Small Business Services and the local chamber of commerce to distribute funds to qualifying businesses. The office of Council Speaker Melissa Mark-Viverito did not respond to a request for comment. Kallos is also open to using his discretionary funds to create the grants, but he has already allocated his funds for this year and won't receive more until July 2015. That may be too late for some Second Avenue businesses, but the proposal could still benefit those affected by other construction projects.